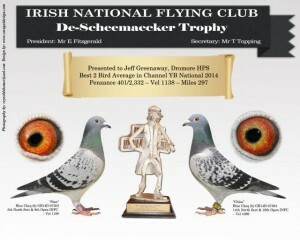 Grand National Penzance Young Bird – Sponsored by Frazers Animal Feeds 380 members have entered 2251 pigeons and are competing for £20,245.00 pools and prize money. The pigeons have been released at 07.40am into a light westerly wind. Next update will be this evening. Grand National Penzance update Wednesday 22:20. Posted on September 6, 2017 – Update Wednesday 6th September 2017 @ 22:30Grand National Penzance Provisional Top 10.1 J. Greenaway Dromore 1055, 2 A. McAteer & Sons Ballyholland 1048, 3 J. Greenaway Dromore 1041, 4 D. McClelland Ballyclare 1034, 5 Mackey & Lockhart Ballylesson 1033, 6 J. Eagleson & Son Ballymena 1024, 7 G. Buckley & Son Annaghmore 1019, 8 J. Greenaway Dromore 1018, 9 C. & G. Quinn Drumnavaddy 1017, 10 McCracken Bros. Banbridge 1006.South Section P. J. Corcoran & Son Balbriggan 90231 first day arrivals recorded. Hours of darkness 20:39hrs to 06:36hrsSecond day arrivals clock checking arrangements. Lisburn, Muckamore and Banbridge all 21:00. Balbriggan & Stillorgan 20:00. For Cork & Wicklow contact your station manager. Grand National Penzance Young Bird National. 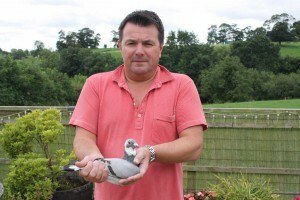 66 pigeons have now been recorded in the race. A third day arrival with a better velocity than 283.9 will qualify for a position. Any member recording a pigeon on the third day should contact the secretary to have their velocity checked. Report and results by HOMER. Click Here! UPDATED!